With respect to the above --- note that a Medical Cannabis like “synthetic substance” is being referred to. Damn it, there is more than one doctor involved in this, as well as a whole University Medical College – That means we wouldn’t be able to just launch a ridicule campaign to discredit her. Too many others involved. However, I got some good news, they didn’t use actual Medical Cannabis but some synthetic stuff. Hurray, we’re off the hook! 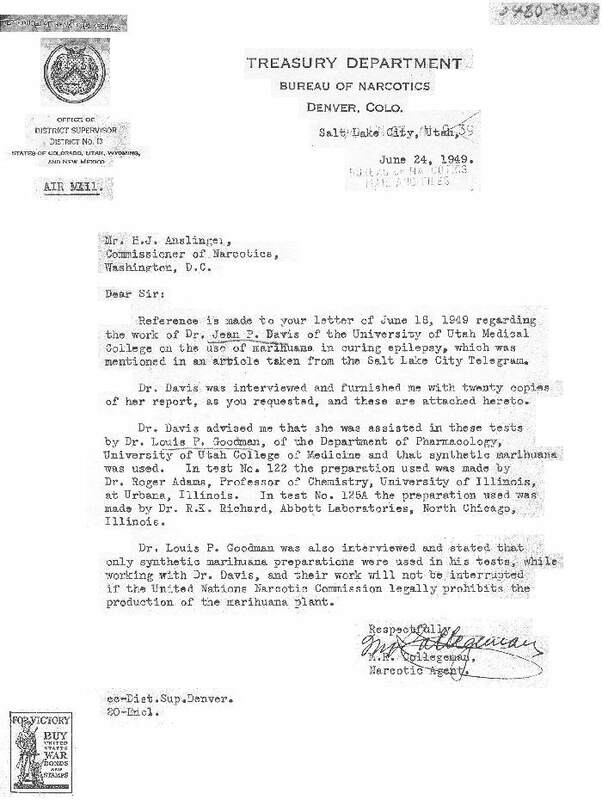 --- The stuff they were using came from two sources (1) A chemist at Urbana University and (2) Abbott Labs. Both of which will play ball with us. Nice people, now let's look more into this “synthetic stuff” and where it came from? 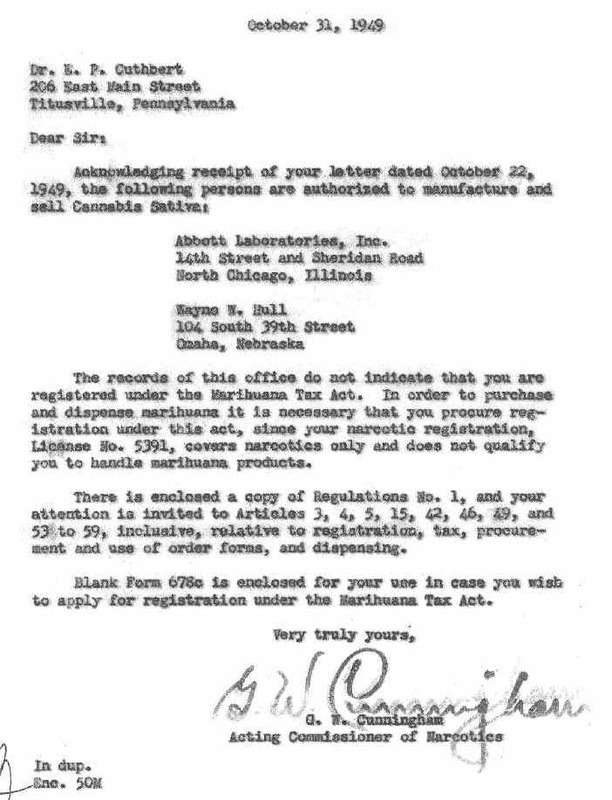 With reference to Abbott Lab’s, repeated letters of inquire with regards to their Cannabis heritage have ALL been met with a good case of amnesia. Boy do they have A-M-N-E-S-I-A, but as they are a private corporation, one guesses that they are well within their rights. However, below is an interesting letter that the reader might take note of; -- Note the date, which corresponds to the dates of the ‘epilepsy study’. NOTE: This letter was written in reply to a doctor requesting information on where to obtain Medical Cannabis. [dealing with the subject of Medical research] . . . Harry, had a special desk with a well-respected chemist to take care of such requests. 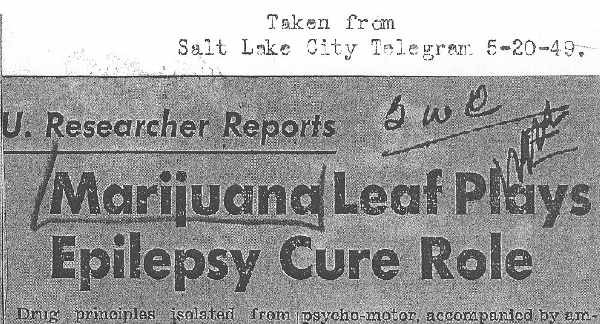 Anyway, that chemist knew what Anslinger wanted and always found some scientific reason to deny incoming Federal permit requests for medical research --- if it had anything to do with Cannabis. . . . 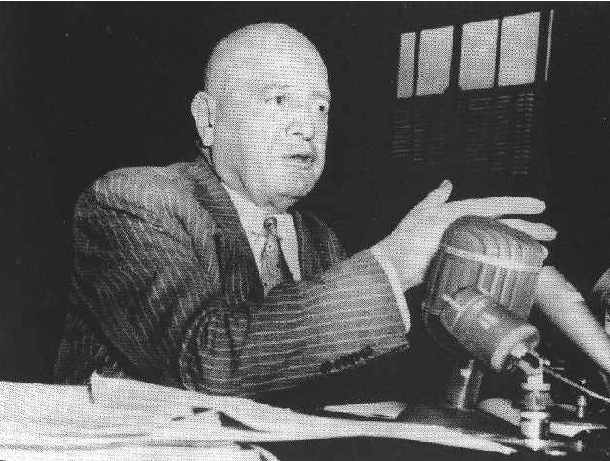 Which explains Anslinger’s anxiety and the Bureau’s special interest in this study in particular. Because this one made use of artificial Cannabis, from two sources that were already licensed under the Marihuana Tax Act by the Bureau. This one seems to have slipped right through the cracks --- thus the reason (in this museum’s opinion) for the special interest from the Bureau.
. . . The narc's have a very long history of repressing / ignoring the truth. . . . There are numerous other ways the narc's have of assuring that Cannabis NEVER gets FDA approval. HOW? "Today, American researchers who wish to obtain legal cannabis for scientific study must apply to the National Institute on Drug Abuse (NIDA), which maintains a government-funded, 1.5-acre marijuana farm in Oxford, Mississippi. Compared with street marijuana, however, the government's plants are low in cannabinoid content, and some researchers have also complained of the institute's slow and seemingly arbitrary decisions. In 1994 Donald Abrams, a professor of medicine at the University of California, San Francisco, proposed to study the effects of smoking cannabis on HIV-related weight loss, but his application was rejected by NIDA, even though it had been approved by the U.S. Food and Drug Administration. When he then resubmitted his proposal, this time emphasizing the drug's potential negative effects, NIDA not only approved the study but also provided him with nearly a million dollars in funding. Another researcher, Lyle Craker of the University of Massachusetts-Amherst, applied to the Drug Enforcement Administration in 2001 for the right to grow cannabis for research purposes as a way of sidestepping these potency and access issues. For three years he heard nothing, until a federal court ordered the Drug Enforcement Administration to respond. They said no, so he sued them. That case is still under way. " Which is a nice way of [saying] -- NO WAY IS IT EVER GOING TO BE RE-LEGALIZED. -- HOMOLOGS - WARNING, no one over here is a chemist, as such we just think of this word as being akin to – an inferior chemical (made in a lab) imitation of a naturally occurring substance. Or something that’s around 85% chemically (just like) but not quite. Thus when someone says, THC-homologs, they mean a synthetic substance or version of the real thing that’s not quite as good. - The narc's did give out permits to do Safety research on Cannabis, but it is a historic fact that they never allowed for any kind of FDA approval type of research to be done -- NO WAY.